Entrecard is a site which according to them acts like a real business card but for online world of bloggers. You just drop your card to whichever blog you visit and blogger behind the blog will get you noticed. It's been almost 2 weeks for me ever since I used Entrecard. The response is good. Besides, the blog has to be the Entrecard member to be able to drop or get dropped. Signup is a cakewalk. The fuel of Entrecard is the entrecard credits. When you signup, you'll start with zero credit and to earn credit, it's simple. Drop your card to every blog which is displaying Entrecard Widget. Each drop you make, you'll earn one credit. So, if you drop your card to 100 blogs daily, you'll earn 100 credits daily. Simple!! It seems quite hectic and time consuming though. Now, advertising plays the role to earn quick credits. If some advertisers come and place their adverts on you, you'll have to approve the advert request. By doing so, you'll earn some quick entrecard credits. How much credits you'll earn from advertisers depends upon how many entrecard bloggers dropped their cards to yours. If 15 people drop their cards to yours, your credit value becomes double the number of people who dropped their cards on yours. So, 15 people dropping their cards will make you earn 30 entrecard credits from individual advertiser. Most of the time, new entrecard members are bombarded with advert requests since it costs too less to advertise on new entrecard member's blog. It compels you to visit blogs everyday, drop your card and earn some credits. Initially, when I did drop my card, I just didn't care much about the blog contents. My only intention was to earn credits as fast as possible so that I could advertise my blog on some other popular blogs. But, as I started dropping my card on daily basis, I came across some interesting blogs where now I spend considerable amount of my time reading them. No matter if you don't care at first, but finally you'll start noticing blogs where you drop your cards. That happened to me and I think Entrecard, the idea is brilliantly working. The reason behind this post today is because, I want to thank one person who is deliberately dropping her card on my blog everyday. As we know, only one entrecard drop,per blog a day is allowed. She's been dropping her card on mine since 10 days. She's Sue from Ohio,United States and she runs a blog called Farvel Cargo. Farvel Cargo is a blog about family life, kids, husband and dog! Also filled with information on selling and shopping online. Truly, I enjoyed reading her blog about her kids, her daily rantings and her personal experiences,stories et cetera. Hey, SUE, thanks for dropping your card on mine and helping both of us earn some nasty Entrecard credits :) Yeas, you were the top dropper of all within these couple of weeks. And thank you all other droppers too. I'll feature any of you guys for second time(after SUE) once you reach maximum drops(this time 20 drops) on mine. 44 clicks from entrecard.com to you. It means what? And what should I do next. Your suggestions. Well,from the stat above,I can see you haven't yet advertised your blog. Well, you can go to CAMPAIGN section and IF you click the MOST RECENT, you can give your AD on the relevant blog by clicking ADVERTISE link under their ENTRECARDS. It'll be the cheapest deal for you since you don't have much credits with you to advertise. And, to find out who dropped their cards on you, You can see it under the INDEX section of DASHBOARD SCREEN. Those are the people who just dropped their cards on yours :) So, you've to keep checking your ENTRECARD DASHBOARD more frequently to find out who dropped their cards. You can also find where your AD is running or pending for approval or if approved from the YOUR ADS section of DASHBOARD. It is only when you buy AD space clicking ADVERTISE link from below the ENRECARD. When Someone buys AD space from you, they shall appear under ADVERTISERS section of the SAME DASHBOARD SCREEN. ANd, Once you approved their ADs, they'll go to next section called ON YOUR WIDGET. Each day for 24 hours, they'll SHOW UP on your blog. So, it takes a day for them to show up and the NEXT on QUEUE will appear after the previous AD expires. The above stat shows, how many times you dropped your card and how many times you received the Entrecard drop. great. I got to know ur page thru entrecard as well. Nice to know a nepalee, cos i wish to go there one day. keep in touch ? btw, niceposting about entrecard cos i don't really know how to use it yet. Hey Navin!!! Thank you for all your kind words. Now I'm under pressure to remain at the top of your list! LOL! Hi Sue, you are most welcome. Wordpress doesn't support neither google adsense nor E-card in free cost website addresss. You were also a user of wordpress. Why did you leave that ? I think there are a lot of facilities that blogspot or blogger.com provides. If it is true then it would be nice not only for me to all to shift toward these kind of blogsites. Widgets that wordpress supports are too little. Do i shift from ametya.wordpress to ametya.blogspot ? 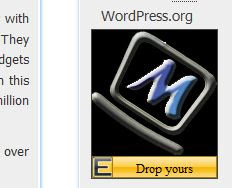 Wordpress.com gives a free blog platform for any blogger. But It doesn't allow any kind of Ads. So, it's extremely useful for them who don't want AD cluttered all around his/her blog. Unlikely, other free blogging platform like blogger allows you to have ADs. So, blogger is for money making fellows as well as for blogging too. Hope that clears some confustions.